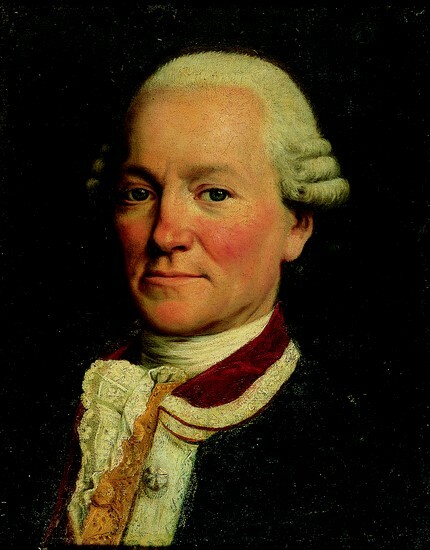 Jean François de Galaup, comte de Lapérouse, 1778. By Marie Renée Geneviève Brossard de Beaulieu/ Jean-Baptiste Greuze. Oil on canvas, 83.8cm x 66cm. This striking portrait is not quite a new acquisition, since it was given to the Fine Arts Museums of San Francisco in 2008, but it has only very recently appeared on the internet and does not seem to have been previously documented. The image on Wikipedia was uploaded on 26th September 2017. It was uploaded to "FineArtAmerica" on 30th October 2017 (so now you can buy a La Pérouse tote bag or yoga mat.....). There is not a lot of information to be had. According to the FAMSF website, the picture was one of a number of 18th-century artworks given to the museum by New York society benefactress, Mrs. Clarence Sterling Postley of Locust Valley. It is attributed to Greuze's pupil Geneviève Brossard de Beaulieu, or possibly to Greuze himself, and dates from 1778. At this time La Pérouse, aged thirty-six or seven, had recently returned from service in the Indian Ocean. He wears the uniform of a lieutenant de vaisseau and sports the Order of St.-Louis which awarded to him in the previous year for his defence of the trading post of Mahé in the Seychelles. The notice specifies that the picture is "not on show", which seems a shame given its obvious quality. 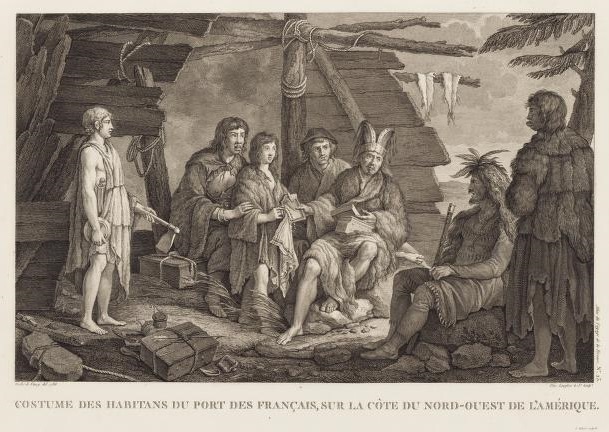 A "curious picture by Greuze representing the famous navigator La Pérouse" is noted as being in the possession of the London art dealer Colnaghi, in the Gazette des beaux-arts for 1862. The Oeuvre de Greuze, catalogue raisonné, 1908, has the following entry: No.1190, Portrait of La Pérouse, Collection Colnaghi in London. Made by order of Louis XVI, with date 1785. Sold 27 April 1856, no.18. 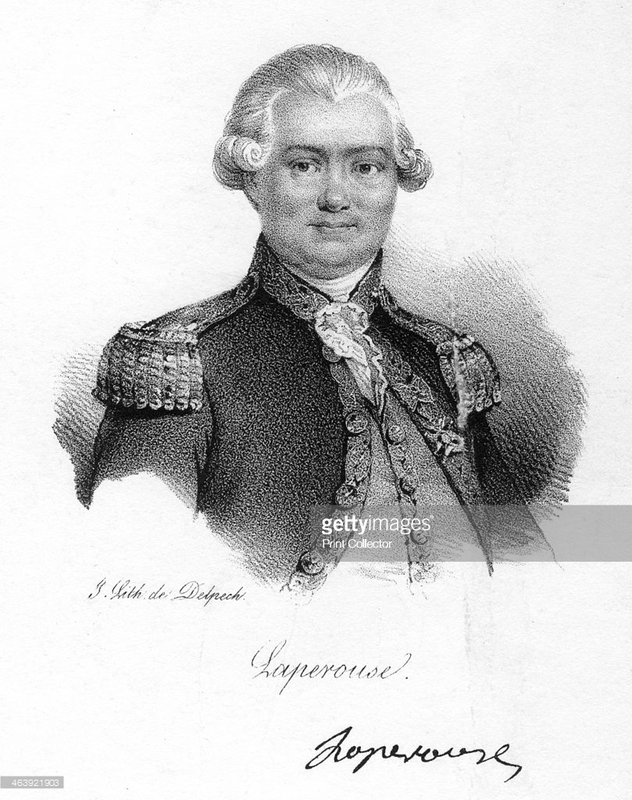 The Journal of the Royal Australian Historical Society for 1927 notes: "In the local museum is a collection of all the relics of Laperouse that could be gathered from his family and elsewhere. 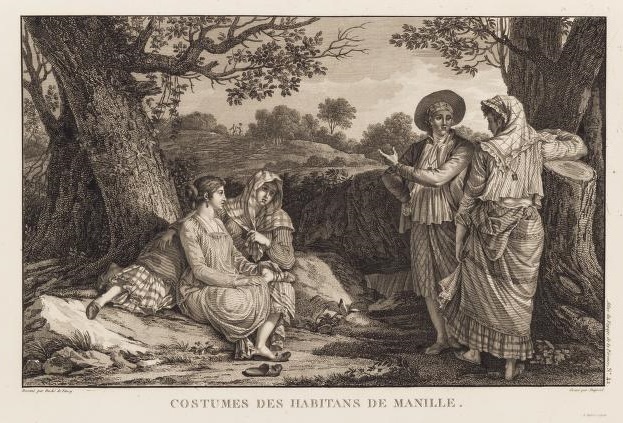 The most interesting piece is a portrait in oils by Greuze, of which I have not seen an engraving or photograph"
Few other contemporary images of La Pérouse are known. The main source of reference is provided by the catalogue to the Centenary exhibition of 1888, which was published in the Bulletin of the Société de géographie. This included a number of portraits and other personal objects, collected by descendants of La Pérouse's two sisters. No.55 of the 1888 catalogue: La Pérouse aged twenty. "A well-preserved pastel: according to family tradition, this portrait was the only one to represent La Pérouse faithfully. The artist is unknown". Belonged in 1888 to the general Dalmas de Lapérouse; now in the Musée Lapérouse in Albi. This is quite a crude image and depicts a surprisingly corpulent young man. 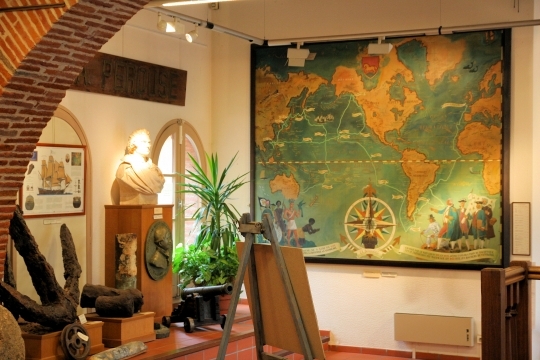 This is another undocumented portrait, reproduced on the internet for the first time when it was exhibited in the 2008 exhibition at the Musée de la Marine.. It is identified as: "Oil on canvas. Attributed to François-Hubert Drouais. Private collection". Perhaps this is the original for the Albi pastel? In December 2002 the Association Lapérouse Albi appealed for donations to buy a portrait which was offered for auction by Drouot in Paris. Sadly it turned out that the label identifying the sitter as La Pérouse was a later addition, and it was decided not to pursue the purchase. 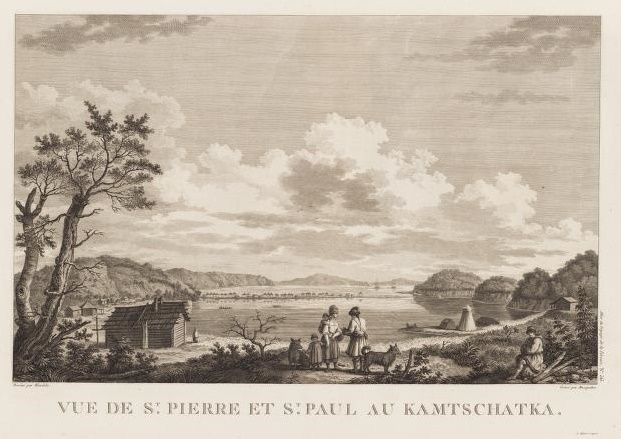 The Centenary catalogue notes the existence of a pair of miniatures which were sent by La Pérouse to his sisters in 1777, after he been made a Chevalier de Saint-Louis. This would make them exactly contemporary with the San-Francisco portrait. Even in 1888 one of them seems to have been known only from a copy: the reference is No.54: "Oil painting by his great-niece Mlle Anna Prunet after a miniature" , collection Barthez Lapérouse (family of the younger sister in Albi). The second, No.56, belonged in 1888 to Henry Peyronnet, a descendant of the older sister. I think the oil painting mentioned is probably the one in the photo below, which shows the interior of the château du Gô with its current owner Jean-Marie Pestel, a descendant and current president of the Association Lapérouse in Albi. 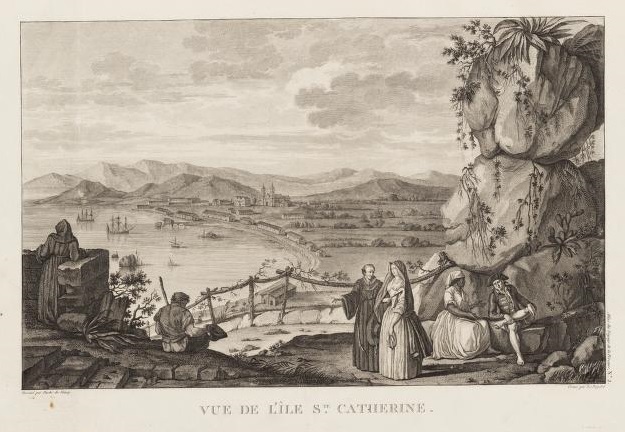 The earliest prints, including the engraving by Alexandre Tardieu of 1793 that was the frontispiece to the first editionof the Voyages, and an English variant by Thomas Woolnoth, are all modelled on the Albi miniature ("a Miniature in the possession of La Pérouse's niece at Alby"). 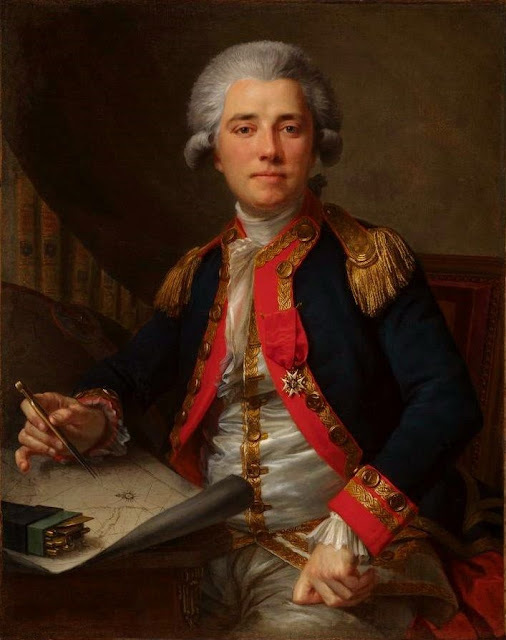 In these images La Pérouse appears noticeably fatter than in the San-Francisco portrait. 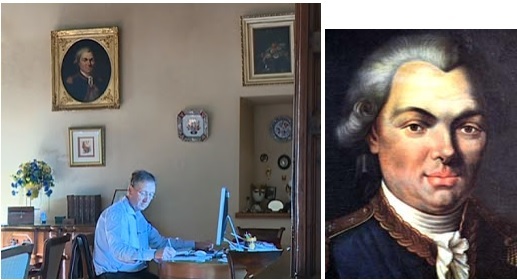 To judge from the oil copy in Albi, this is partly the way the original has been interpreted, or may be it is an authentic memory of the older man? In 2005, remarkably, a third miniature, probably from the same set, was located. In 2013 it was generously donated by its owner, the naval commander André Amet, to the Museum in Albi. The portrait had originally been in the possession of La Pérouse's wife Eléonore Brodou. It had been inherited by her niece Eugénie, and remained in her family - according to Commander Amet, it passed through six generations from mother to daughter, then from father to son. The 1888 catalogue lists a further miniature: No.59: 4cm x 5cm in a square frame in black, artist unknown, which depicts a later La Pérouse in captain's uniform, also from the Barthez de Laperouse collection. It is not really clear whether this can be regarded as an original. It is engraved as the frontispiece to the catalogue. This is really quite a leap from the lithe, debonair young man of 1777! One thing is for certain, had he lived, the ravages of the expedition would have taken their toll on La Pérouse's appearance. No doubt his paunch would have diminished, but he wrote ruefully from Sydney, "when I return you will take me for a centenarian, I have no teeth and no hair left". [Letter to Lecoulteux de la Noraye, 7 February 1788]. 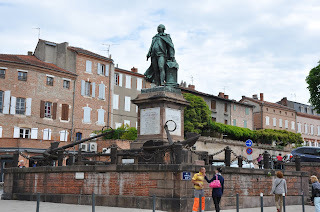 The town has a central place Lapérouse with a bronze commemorative statue by Nicolas Raggi which dates from 1853. Bones from Vanikoro were ceremonially deposited in its base in 1988. The museum itself is a comparatively recent initiative. The prime mover was Pierre Amalric, a retired ophthalmologist and member of the French National Academy of Medicine. In 1977 Dr Amalric journeyed to the South Pacific and returned with a number of relics from the shipwrecks, which had been given to him by the authorities in Port Vila and Nouméa. 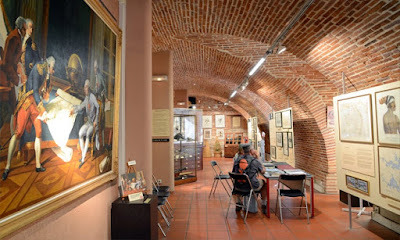 In December 1979 a small exhibition was held in Albi's Musée Toulouse-Lautrec. In 1983, with the bicentenary of La Pérouse's voyage upcoming, the Association Lapérouse-Albi was formed with Dr. Amalric as its president. 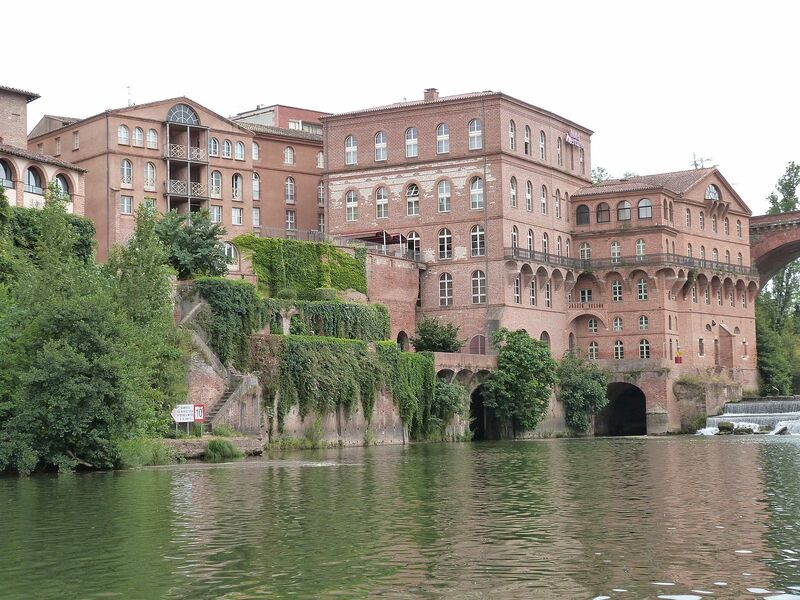 In 1985 the society organised an international symposium and a more ambitious exhibition at the Palais de la Berbie in Albi. 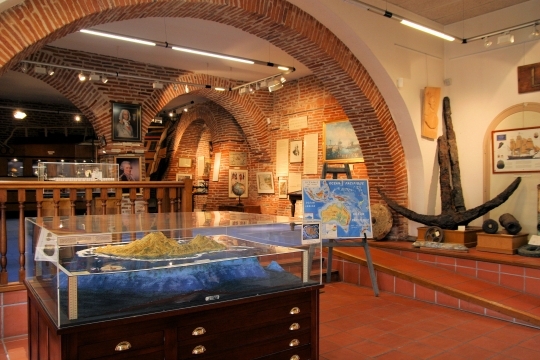 Efforts culminated in 1988 in the creation of the Musée Lapérouse, which coincided with various commemorations, including the inauguration of the Lapérouse Museum in Botany Bay. 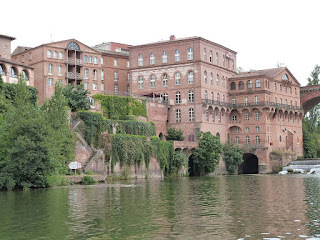 The museum is situated in the attractive setting of les Moulins Albigeois, a former pasta factory (vermicellerie). 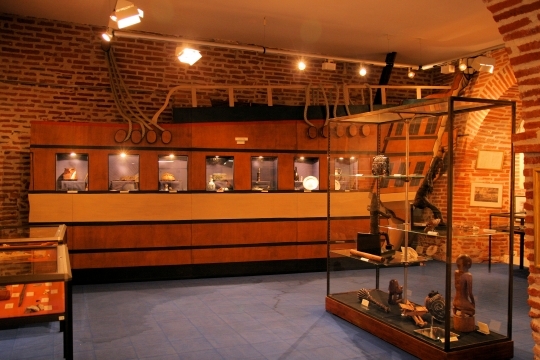 There are now some 640 exhibits: models, navigation instruments, weapons, uniforms, and items from the shipwrecks, most of which were presented to the museum by the Association Salomon in 1999. There are large items such as cannon and anchors but also tiny needles, pins, buckles, plates, glass phials and shot balls salvaged from the excavation sites. Entry area: Displayed here are a model of the island of Vanikoro, portraits and a bust of La Pérouse, plus some larger item [anchor, cannons] from the wrecks. Upper room: The theme of this part of the museum is the history of exploration up at the time of Cook and La Pérouse, and beyond. 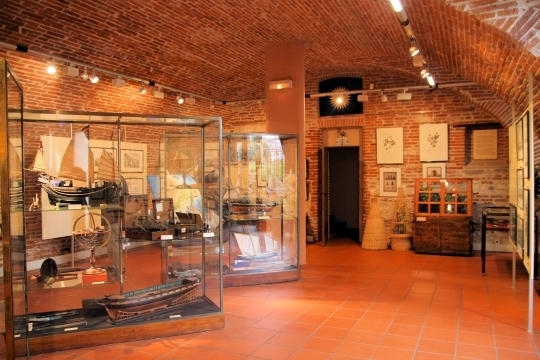 The majority of objects donated by the Association Salomon are on show here; the main display case, which contains eight glass cabinets, is built to resemble a ship. Also in this area is a small ethnographic collection featuring objects created by the peoples of the South Pacific. 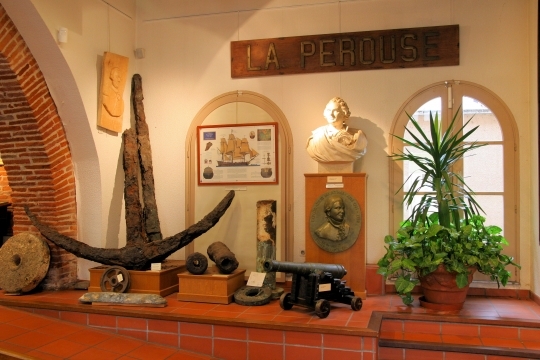 Lower room: The exhibits here retrace the early life of La Pérouse and the stages of his voyage. Freestanding glass cabinets display related nautical exhibits: navigational instruments, naval uniforms, model ships. High quality copy of the Monsiau's painting of La Pérouse receiving his Instructions ; by Daniel Roustit, a local artist from Albi. Original pastel portrait of La Pérouse aged twenty. Original miniature dating from 1778 presented to the museum in 2013. Copy of the bust by François Rude in the Musée de la Marine in Paris. 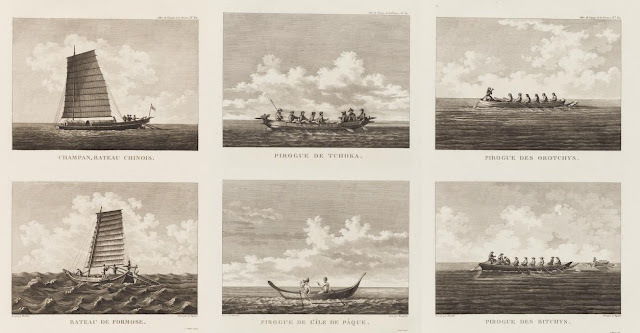 Series of pictures by the marine artist Jean Bellis which reconstruct scenes from the voyage. 3-D model of the port of Brest in the 18th century, made by MM Rossignol and Pierre Bérard. 3-D model of Vanikoro by Rossignol. Baskets and a cabinet for the transportation of plants; reconstructed by local craftsmen from the designs given in the Instructions. 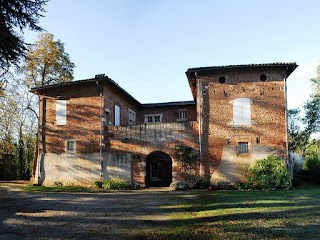 The new Collection La Pérouse website can be consulted for a full listing. Religious items, including a portable stone altar. 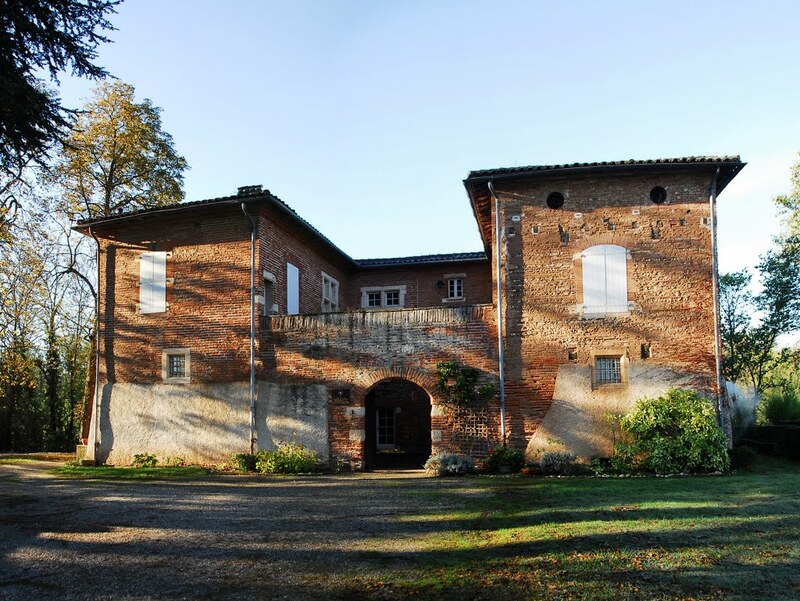 In January this year the Association Lapérouse gave over direct management of the museum to the municipal authority, in part with a view to safeguarding the salary of the custodian / curator. Sadly all has not gone well. 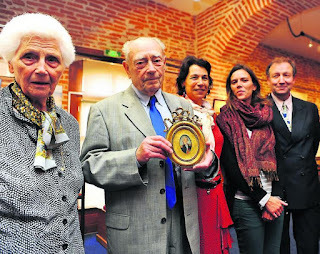 In March 2018 an article appeared in a local newspaper in which the president of the Association, Jean-Marie Pestel, complained that the memory of La Pérouse has been neglected. The museum has been forced to close its souvenir counter and, to add insult to injury, advertisements for local attractions, placed at the foot of La Pérouse's statue in the square named after him, did not even mention its existence. What really rankles Jean-Marie Pestel, is the large scale of investment in remembering La Pérouse elsewhere: a new attraction at the Puy du Fou theme park costs several million euros, and there are major plans for the "Brest 2020" festival, including a promise from the Musée de la Marine in Brest to double the floor space devoted to its La Pérouse exhibit. "Le navigateur Lapérouse n’est pas prophète en son pays" Journal d'Ici [Tarn et Lauragals] 06.03.18. He will direct the draughtsmen embarked on board the frigates, to take views of all remarkable places and countries, portraits of the natives of different parts, their dresses, ceremonies, games, buildings, boats and vessels, and all the productions of the sea and land, in each of the three kingdoms of nature, if he shall think that drawings of them will render the descriptions more intelligible. 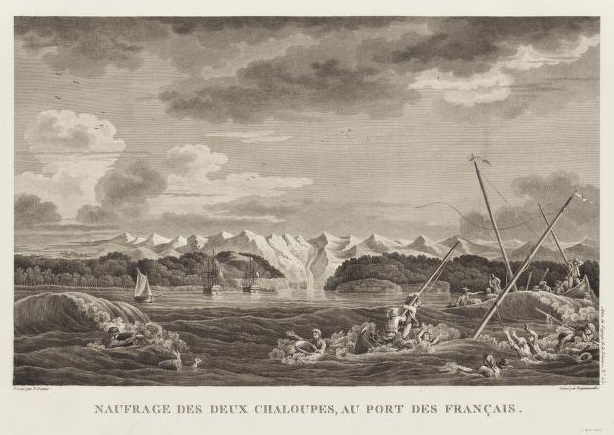 Gaspard Duché de Vancy (b.1756) was the official artist of the expedition. 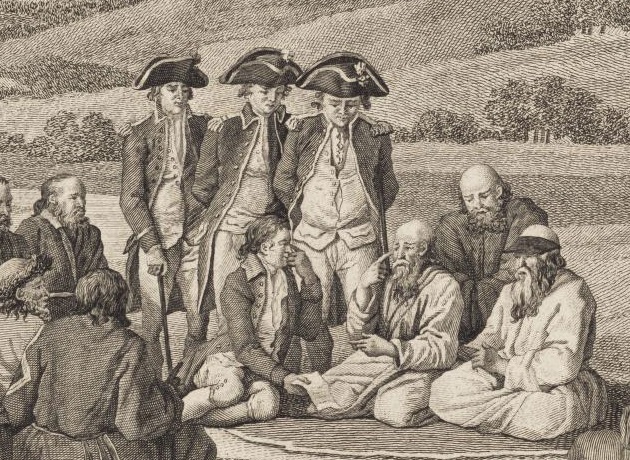 His presence confirms the prestigious nature of the voyage, since he was a society artist who enjoyed the patronage of Court circles - including that of the expedition's sponsor Jean-Joseph Laborde. He had been raised in Vienna and executed several royal portraits, including Stanislas of Poland and Marie-Antoinette (no longer extant?). 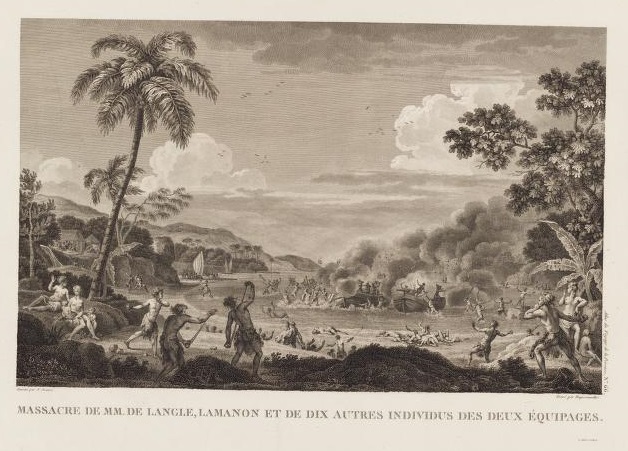 Although his pictures were meticulously observed, his formal classical training is evident; it is often remarked that he viewed the natives of the Pacific with "des yeux versaillais". 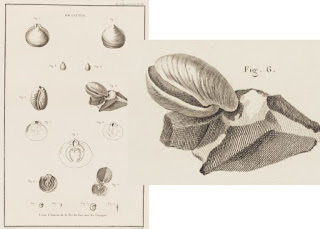 Guillaume Prévost (b.1738) volunteered to take part in the voyage as official "Botanical illustrator", for 1,000 livres a year. 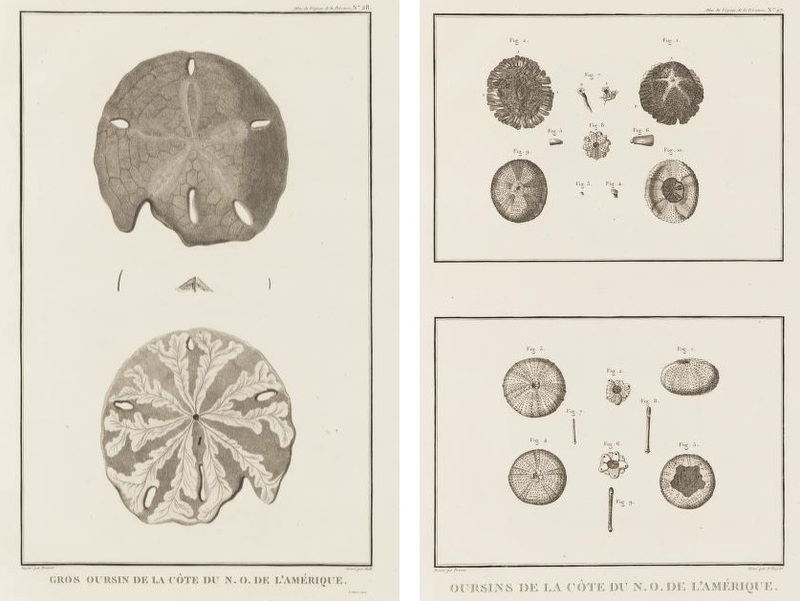 He was assistant to the doctor and naturalist La Martinière on board the Astrolabe. He came from a family of flower painters; he and his brother had worked on the famous "Hortus Cellensis". 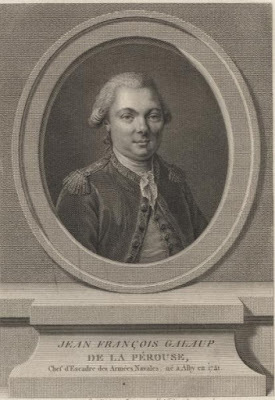 His young nephew Jean-Louis-Robert Prévost embarked on the Boussole. 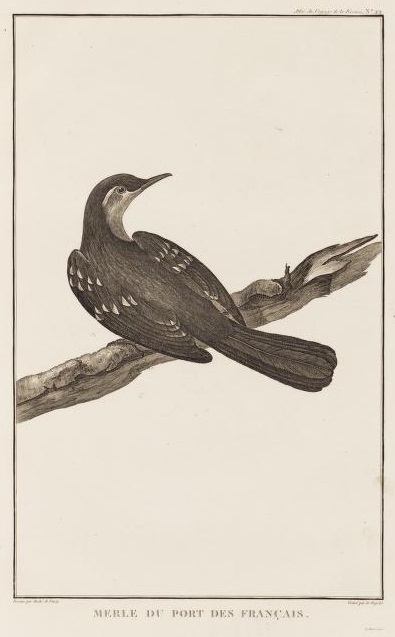 It would seem that Jean-Louis-Robert was the more talented and industrious of the two; his surviving drawings include not only flowers but birds, fishes and shells. 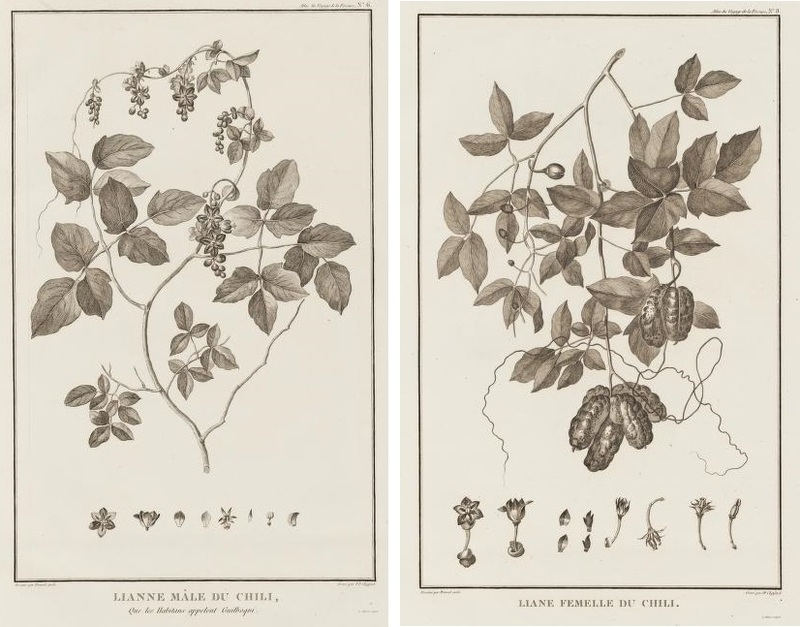 See: Gabriela Lamy, "Les Prévost, peintres de fleurs..." Bulletin du Centre de recherche du château de Versailles, online article of 16th February 2017. 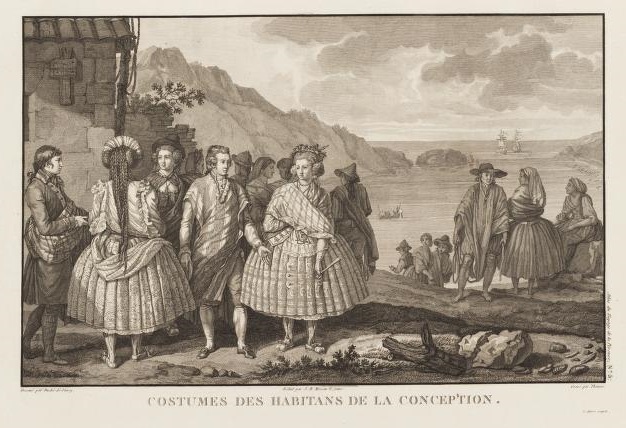 No.2: Dress of the Inhabitants of the town of Concepción, on the coast of Chile. 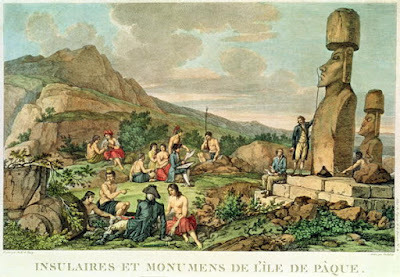 Drawn from life by Duché de Vancy, in March 1786. 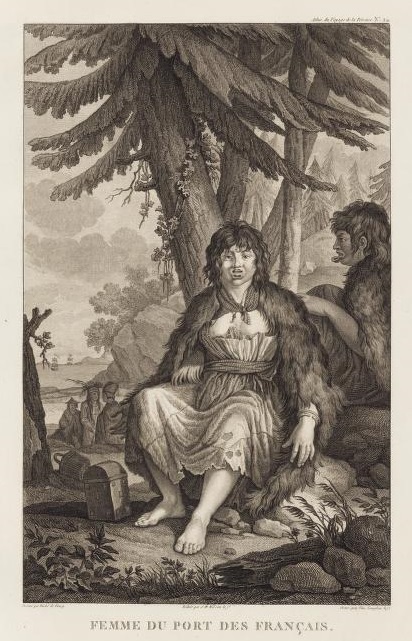 No.3 and no.4: Lianne of Chile, called by the inhabitants Guilboqui. [Male and female vines] By the elder Prevost. No.5. Inhabitants and Monuments of Easter Island, drawn from life by Duché de Vancy, 9th April 1786. White chalk and ink on paper. Plate III, Figure 5. 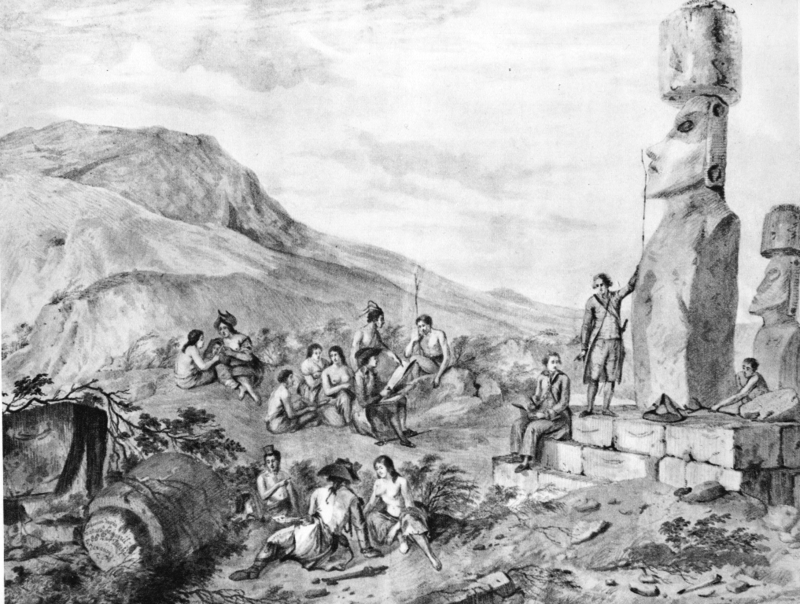 Islanders and monuments on Easter Island. 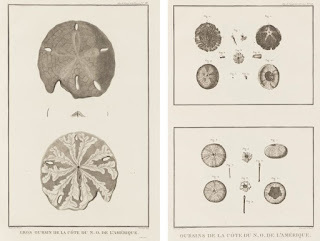 Pencil drawing from nature, April 9 1786, by the artist Duché de Vancy, who accompanied La Pérouse on his voyage around the world. The original drawing, in the archives of the Marine Library, is reproduced here for the first time, thanks to the kindness of Commander Vivielle, curator of the museum. 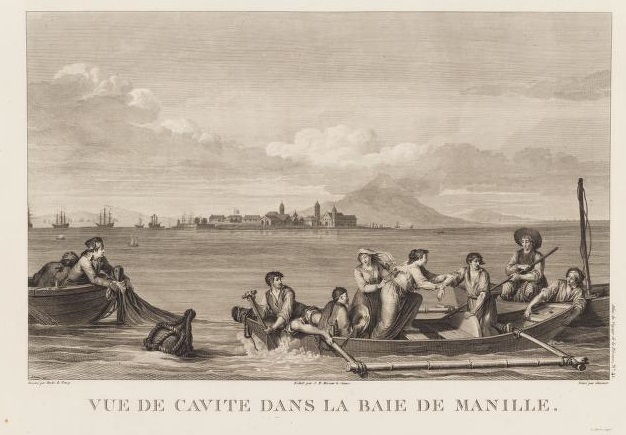 A lithograph, based on this drawing but with some modifications, was published in the Atlas of La Pérouse’s Voyage around the World in 1797, and it is this lithograph that has been reproduced so frequently to date. Notice the facial features of the natives and, in particular, of the women. 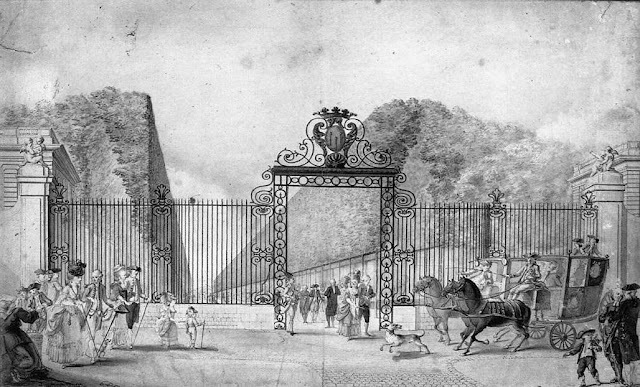 Similar features are found in later illustrations by other artists. Note to the boat-shaped head covering made of hibiscus twine (anu)...The image is now also available commercially from the Bridgeman Art Library. 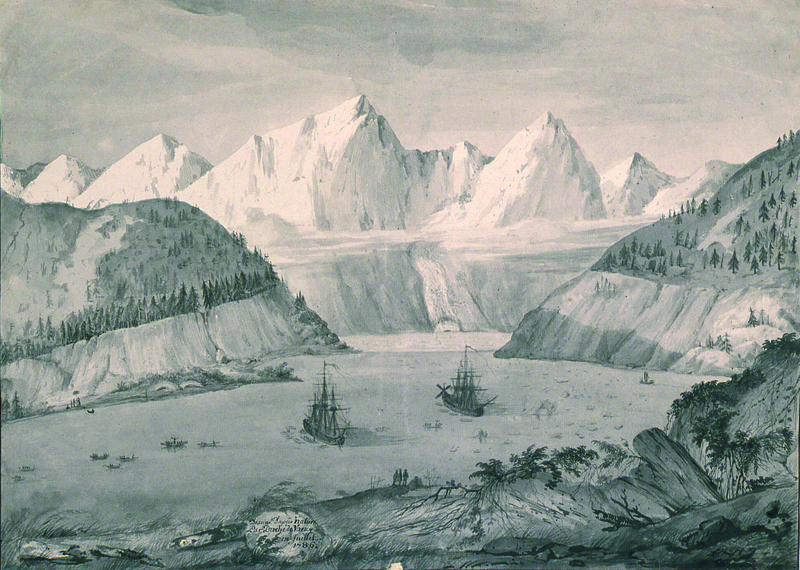 No.6: Anchorage of the Vessels, at the Island of Mowee [Maui], drawn by Blondela in 1786. No.7. 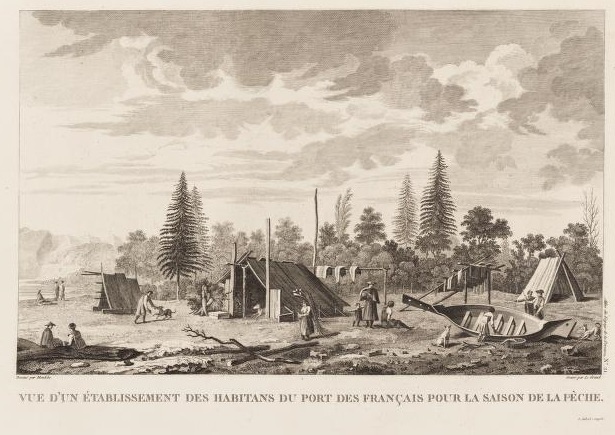 Establishment of the inhabitants of the Port-des-Français [Lituya Bay] for the fishing season, drawn from life by Blondela. No.8: Interior of Port-des-François [Lituya Bay], drawn from life by Blondela and no.9: by Duché de Vancy in July 1786. Neither of these two sketches was engraved for the 1797 Atlas. 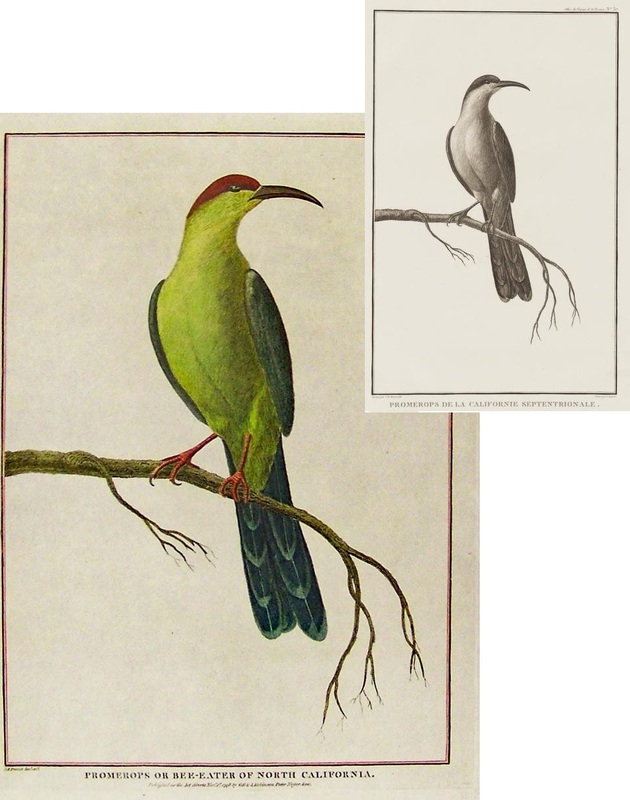 Both are available on Getty images, from a later set of engravings. 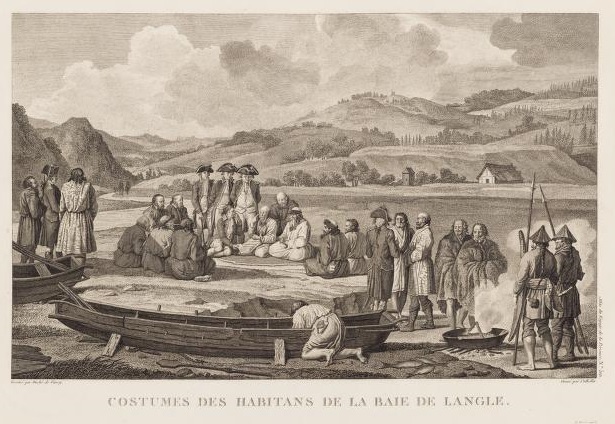 No.11: Dress of the Inhabitants of Port-des-François on the North-West Coast of America. 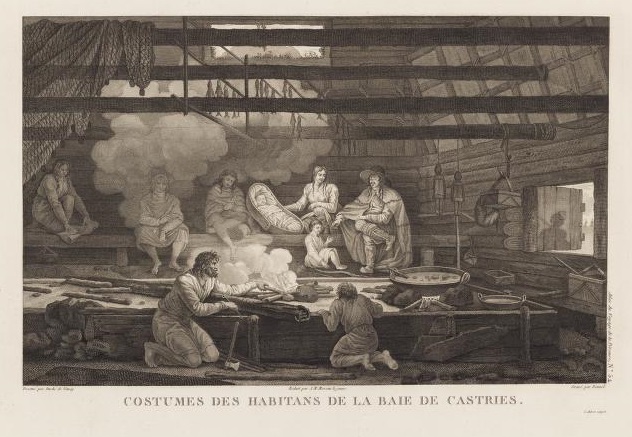 By Duché de Vancy, 1786. No. 15: Promerops or Bee-Eater of California. "J.-R. Prévost fils pinx." 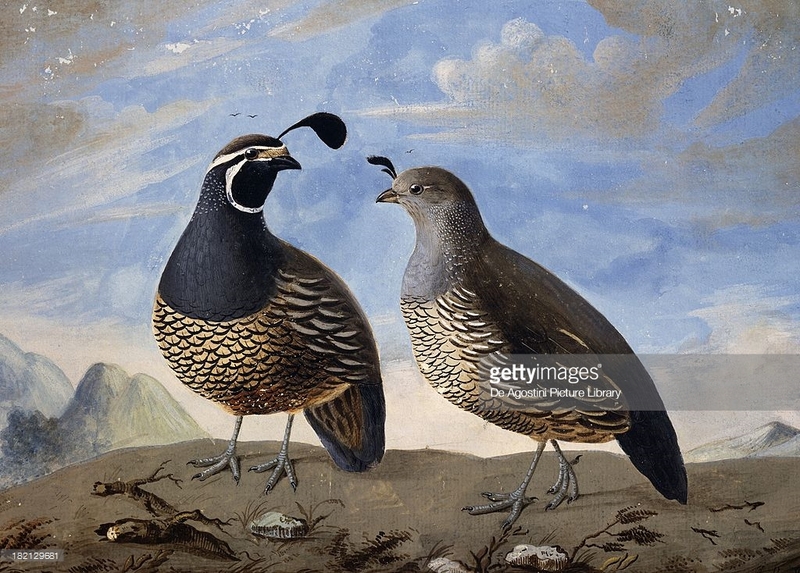 The coppices and plains are covered with small grey crested partridges, which live in society like those of Europe, but in covies of three or four hundred. They are fat and excellent. 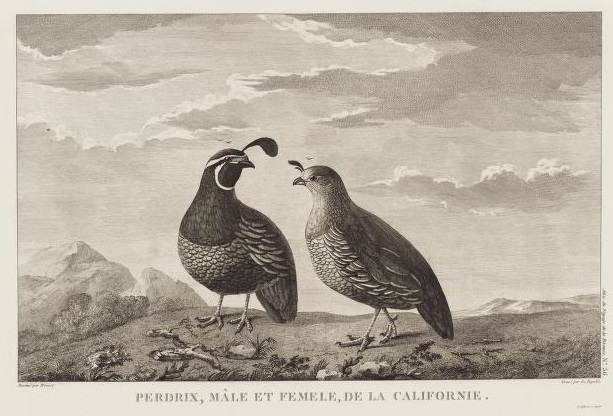 The earliest known European images of California to emerge from direct observation are two ornithological drawings, pictures of a California thrasher and a pair of California quail, executed in Monterey in 1786 by Jean-Louis-Robert Prevost, one of the artists who accompanied the famed French navigator La Pérouse, on his final, ill-fated voyage to the South Sea. 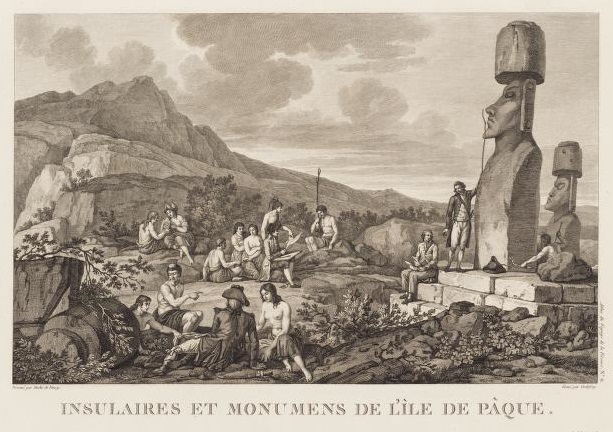 Of the two pictures, published eleven years later in the posthumous Voyage de La Pérouse, the latter is more engaging. 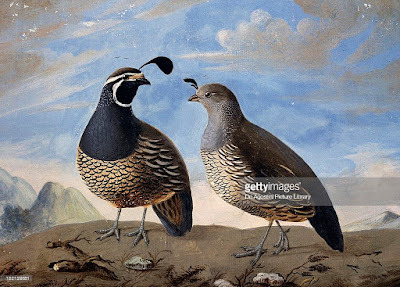 It shows a male and female of the species posed on the brow of a hill, the pair characteristically active and alert, and in the best tradition of expeditionary art, the illustration is both aesthetically pleasing and accurately drawn. 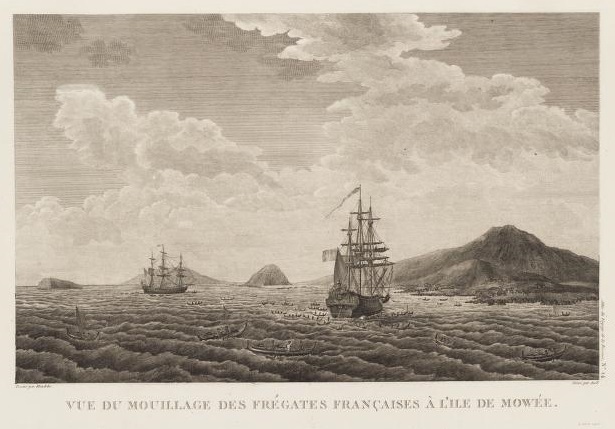 The bay on which Tomari now stands was visited between July 12 and 14, 1787 by two French frigates, Boussole and Astrolabe, commanded by Lapérouse. The French named it Langle Bay after the captain of the Astrolabe. At that time, it was no more than a small cluster of huts. 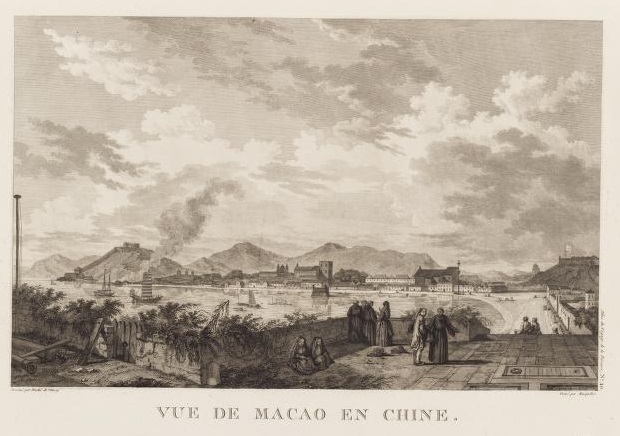 The French had good relations with the local people who they considered to be in the very distant past of northern Chinese origin, describing them as intelligent, good-looking, and short in stature. 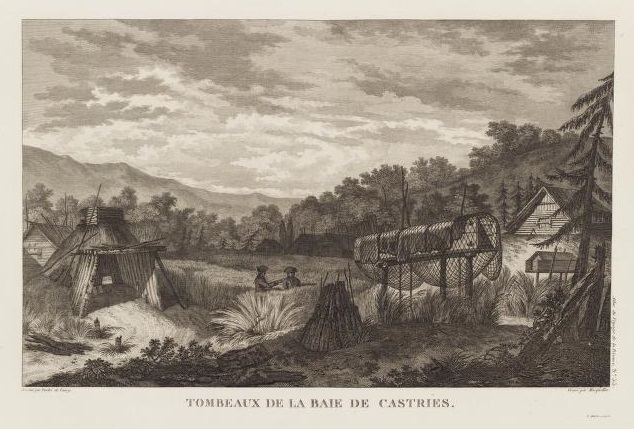 The locals were engaged primarily in fishing, hunting, and herding, with hardly any agriculture. They traded regularly with the communities on the Amur River on the mainland and with Japan. 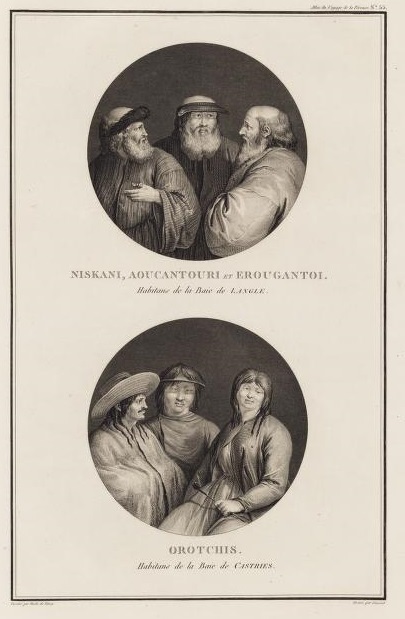 Lapérouse gives a very detailed description of his relations with these people in his work Voyage de Laperouse Autour du Monde, published in 1797. Wikipedia:"Tomari, Russia"
Also included by Millet-Mureau in the Atlas were two engravings after drawings by the draughtsman and naval engineer Nicholas Ozanne. They depict significant incidents in the Voyage, the loss of two ship's boats in Lituya Bay, Alaska and the attack on Langle and his landing party in Samoa.
. 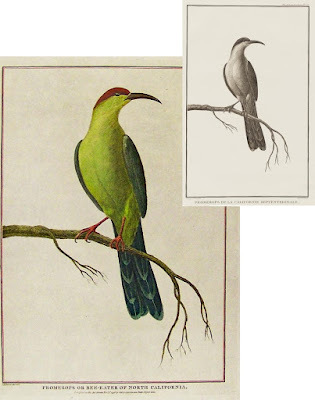 Both plates were engraved by Dequevauviller.